Aufer has in stock for our customers, a wide range of consumables for th graphic industrie. Technical support, software upgrades and retrofitting of machinery. Repair and/or supply of spare parts and electronical equipment for the industry. Preventive and corrective industrial maintenance. Solutions in galvanic treatments and surface finishing. Our blades offer a high quality, inside minimum tolerances and a consistant straighness which fullfills the printer needs. AUFER SOLUTIONS is a dynamic and flexible company, born to help the graphic arts industry, galvanic industry and metal industry, providing our customers a wide range of solutions and services according to their needs, such as technical service, spare parts and consumables. Our experience of many years working in the industry, let us to have a good knowledge of the market and grow good relations with our customers. Our aims are seriousness and trust to our customers. We are able to communicate in several languages and we have a high cultural adaptation capability due to our experience with more than 10 years working face to face with worldwide people and companies. In rotogravure, flexo and other printing and coating processes the doctor blade removes the excess ink from the smooth non-engraved parts of the image carrier and the areas of the cell walls. 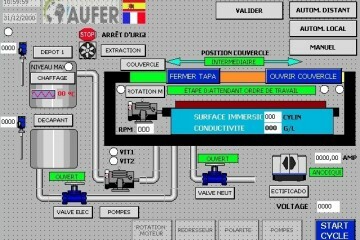 Aufer is in a position to make software and hardware upgrades on all machines. Our cleaning systems are cost effective and environmentally friendly, also free up your valuable time for more important tasks.